Every story we hear or read about the average car-buying experience always seems to involve someone driving off the lot in his new automobile, but stuck with a less-than-satisfactory auto loan on his hands. In a perfect world, the best car deals would benefit the seller and buyer equally; unfortunately, endless negotiating and haggling — usually to the detriment of the motorist — are the normal car-buying proceedings. There are plenty of decent, honest car salespeople out there, but they need to make a sale, too, so it’s often hard for the common consumer to compete with their training and skill, and to gain the upper hand in securing financing on a new or used car. But with some careful research and timing, in tandem, it’s possible to turn the tables to your advantage and get a lower price and interest rate from the car salesman — just by visiting the dealership at night. It’s worth repeating that timing is everything — the first thing to remember is when you’re most likely to get the best car deals. Conventional car-buying tips like to remind us that there’s no single time of the day, week, month or year when we can obtain a better deal on financing a car. Not even the weather makes a difference, according to MSN Money. But other sources say otherwise. According to a Popular Mechanics interview with an anonymous car salesman, there are certain windows of opportunity when salesmen are more vulnerable to backing down or relenting on a customer’s offer. So, keep in mind that the end of the month is a good time to make an offer on a car because dealerships are looking to fill their quotas. Also remember the end of the season, too — for instance, during the summer or early autumn months, many dealerships are receiving new models for the following year and look to quickly unload leftover models from the prior year. Once you’ve got that timing figured out, start conducting your business in the evening hours to pressure the dealer. 1. Do your research at night. Browse your local car dealer an hour before it closes to check its inventory — heck, you can even look at the merchandise, sticker prices, etc., after they close. Do some internet cross-checking and personal budgeting, and you’ll have most of the ammunition you need before associating with a single car salesman. Think about test drives later — the important part is to get the facts on your future car, from the web and your own eyes. 2. Bring a buddy. Whether it’s your spouse, significant other, best friend or Uncle Ted, two heads are better than one and less likely to succumb to a high-pressure sales tactic. Horror stories abound of people who step onto a showroom floor unprepared 15 minutes before closing time, only to be talked into buying a car by 9 p.m. at a 12% APR. Bringing a trusted friend or family member will help maintain your perspective. If he’ll be co-signing the vehicle with you, you’ll need his OK anyway. 3. The element of surprise. One caveat to the rule is to visit the car dealership in the daytime for test drives. That way, you can see any visible scratches or damages (if you’re looking to go used) with a car salesman present. Plus, there’s the safety factor of driving and viewing a car in the daylight. You might even tell the salesman that you’re interested and planning to stop by again this weekend in the late morning or afternoon. The only difference is that you’ll wait until the evening hour to counter some dealer pressure with buyer pressure. 4. Lunar negotiating power. You don’t need to use the Jedi Mind Trick on a car salesman to get the deal you want (though that would be pretty cool to see). You do, however, need to stand your ground — and some of the best leverage you can get is making your own one-time-only offer in the evening. 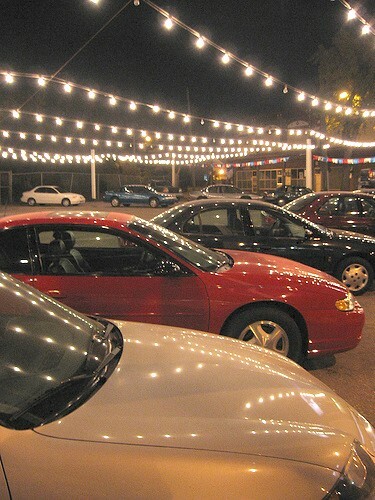 Approaching the night-time car shopping experience unprepared can leave you vulnerable to methods that can disadvantage you beyond financial repair. “Yo-yo financing” is one such practice: customers drive home in a new car without having to wait for their financing to be approved. The problem is, if it’s a late-night deal, the dealer’s credit office will be closed, meaning that you could be denied when it opens the following day and subsequently be asked to return the car. Experts advise people to make sure their credit is approved before signing off on a car. Shopping for a new car can be a time-consuming experience no matter what time of the day you choose. With some basic car-buying tips, you can conduct your car-buying research and be prepared when you walk into the dealership, day or night. What Is a Joint Auto Loan? Volkswagen Sign Then Drive Lease Deal: Is It Worth It? Taken For a Ride: Is Dealership Financing Ever Worth It?